The applause, it burns, unfortunately I also have chronic style change disorder....... When you start working on something, then halfway through give up because there are two separate styles clashing most horribly. Yeah that's me. Wow, they're all so amazing!! It's really great! I can see great process through the year! Such improvement in just a year. Keep it up! I feel like you could have sold this as a 2015 Calendar if there was art pieces for September and October lol. I wouldn't say inconsistency, it would be developing and growing. August, november and december... Wow, you're awesome! march, may, august and november!! so talented! the amount of improvement since i started following you is amazing. Keep up the beautiful work! I love your style so much, especially the incredible colors and shading... November's drawing looks completely stunning. Your art is amazing! I lovee your styles and you are always improving! It is amazing to see your growth from year to year and month to month. Keep on arting! You are a beautiful artist. 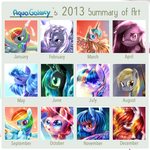 a year of awesome art for sure! Nice work! wow that improvement yo, this is amazing! I CANT WAIT TO SEE ALL THE OTHER ARTS YOU HAVE IN STORE FOR US! It's all so amazing. Your such a great artist.